Green Label is coming to ComplexCon! Rocking the Long Beach Convention Center is our unforgettable exhibition The Camo Collective, a multi-media, all-immersive, walk-through art, music, style, and tech experience dedicated to camouflage, created by Green Label in partnership with youth culture firebrands VFILES. 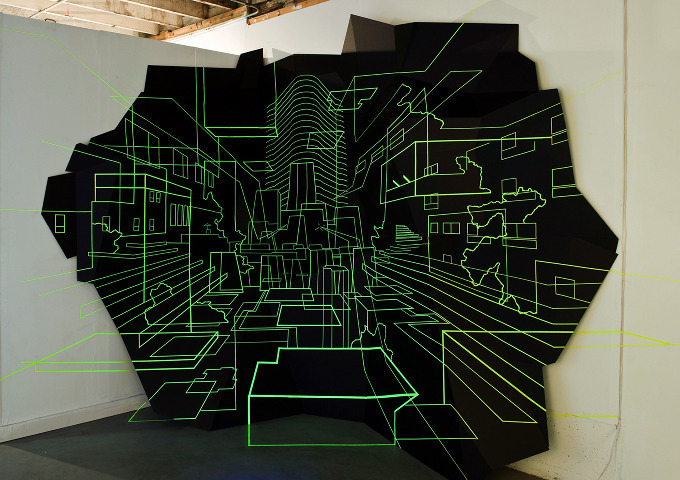 Featuring the works of multiple artists, designers, and DJs, one of the standout pieces in the exhibition is by Damien Gilley, a Portland artist whose work “exposes hidden architectures,” and whose installation will surprise visitors by containing more than meets the eye. Introduce yourself in 140 characters or less. I am an artist working in large scale, perceptual installations that combine architecture, geometry, and illusion. What does camo mean to you? Camo is an in-between state, the moment when you are neither hiding nor apparent, fluidly existing in the moment. Do you own any camo? I have some things that might relate, more like patterns, as I love optic geometry and how that relates to a human body wearing it. For people coming to visit The Camo Collective, what can they expect from you? They will see architectural deconstruction that makes sense, yet won’t fully complete itself, yet has a perceptual quality of spatial illusion. What type of camouflage animal would you be? Why? I would be a cuttlefish so I could just pulse electric light all day deep in the sea.